Welcome to my brand new blogpost series! I really enjoyed doing my face in products series and I knew I wanted to do something similar again so I began brainstorming and came up with a budget version. 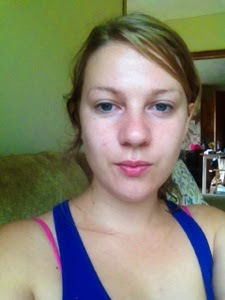 I have planned for this series start to coincide with my 1 month blogiversarie! And I plan on posting a new post from this series every Friday for the next 5 weeks. Every face of the series will come in complete at under €20 (or very close to it!) and in most cases much much less. The majority of the products I'm using for this are really new to me and so I am trying to push myself to experiment with the make up in ways I wouldn't normally. Some of the products have been kindly sent to me by the brands, my opinion on these products are my own and I will place a * beside these products. For my first installment I have created a daytime casual make up look using only 4 products and all coming in at the budget price of €15.44. First up was my base Wet n Wild Cover All Foundation. In the interest in keeping the final look as budget friendly as possible I haven't used any concealer or powder to set this. This foundation claims to be medium to high coverage and I'd go more toward the medium, it took a lot of product to cover my face two squeezes to be exact. The consistency is good a little on the watery side though. It was easy enough to apply this look was done with a stipple brush but I later tried it with a sponge and that was way better. I used shade light/medium and I'm a mac nc 20-25 just for reference. This foundation comes in at €4.99 and for that price it's ok for a daytime base. 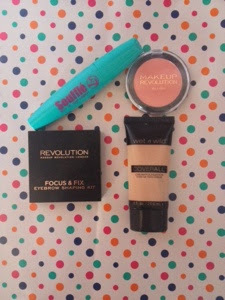 The second product I used was Make up revolution blush. This was in shade treat, it's a deep coral/pink colour and at €1.20 it's perfect for adding a pop of colour. Next up is * W7 soufflé mascara in Blackest black. 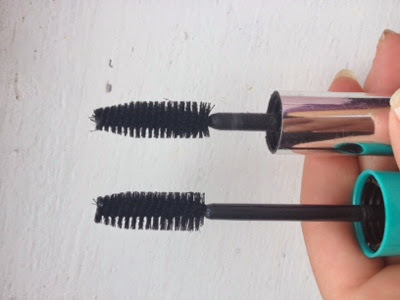 As those of you who read my blog will know I'm very fussy when it comes to mascara as it's not just any mascara that will make my lashes well look like lashes! This mascara has a really big thick brush that reminds me of the brush from Benefit BadGal. The BadGal is silver, soufflé is blue. You can see here just how similar they are. It goes on easy feels light and leaves lashes really nicely defined. It's light enough to do up to 3 coats which leaves lashes really full and defined. 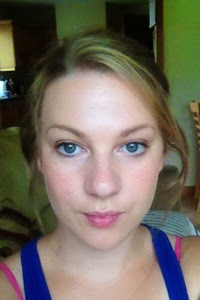 In my opinion this is a definite dupe for Benefit BadGal mascara and a steal at only €6.25. Finally I pushed myself a little for this I used Makeup Revolution focus & fix eyebrow kit. I used this on my brows but this kit has 3 different shades for brows so I also used this kit for today's eye make up. I used the lightest and darkest shades for my eye look and the middle on my brows. The lasting time wasn't amazing on my eyes but it may last longer with primer. At €3.00 it is perfect for a multi-tasking handbag essential. As always find my before ( it was very very early) and after selfie . I hope you loved this post and are as excited about the new series as I am.